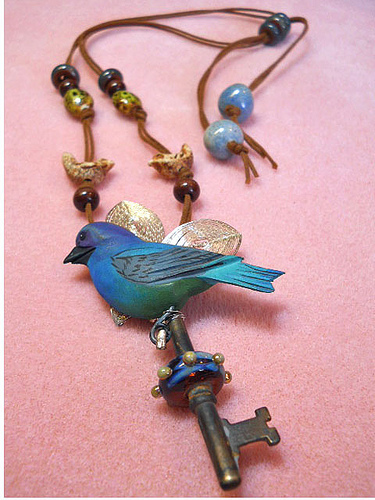 "The key would have been perfect as the focal but Cece went a step further by adding the bird. I love the addition of the smaller birds. The natural leather adds an earthy feel. This months theme is all about birds! " The bird is the perfect touch! Love it! Gorgeous bird!!! I've been looking for just the right piece for this challenge, this is terrific! Wow...what a stunning piece and truly one of a kind! wOW! rEALLY woW! cONGRATS cEce. wELL dONe! I'm liken' that pretty bird and that Key!!! Great design! The wonderful imagination of some people just boggles my mind!